Get your gifts by Christmas! FREE SHIPPING! ONLINE EXCLUSIVES Shop now before they're gone! 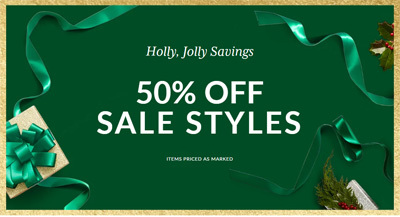 Holiday SALE: 50% off select colors. Receive a free quilted fleece blanket with any purchase of $125 or more. Free Lighten Up Travel Duo in Kiev Paisley with any full-priced purchase of $100 or more. Through wednesday, january 11 while quantities last. Discount taken at checkout. u.s. orders only. Through Wednesday, December 14SELECT FULL-PRICED GIFTS ONLY. DISCOUNT TAKEN AT CHECKOUT. U.S. ORDERS ONLY. 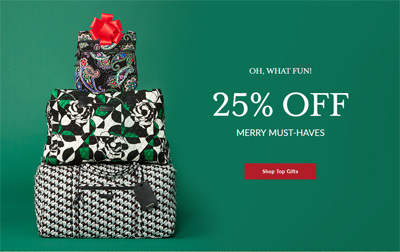 Vera Bradley is a brand that makes bags of all kinds ranging from small makeup bags to purses and even luggage. They now have a full line of accessories including eye wear, footwear, hair accessories, key chains, scarves, and sleepwear. 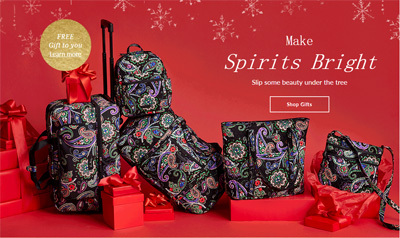 They have many patterns to choose from and Vera Bradley makes it easy to match all your items using the same pattern.